Wanna warm up? Pull your zipper up! Wanna cool down? Pull your zipper down! In our modern, thermostatically controlled world the need to dress right in order to survive does not normally rate high on the “things to remember” list. That is until the moment you step out the door and go on an expedition when simple dress up lessons become important and could make an enormous difference to your wellbeing. So, here are a few suggestions of what our experts recommend to get the best out of your clothing systems. It pays to get the simple things just right. It is tempting to assume that when things get a little nippy that putting on a lot of clothing is the sure-fire solution to keeping warm. This is great when stationary but once on the move things start to heat up quickly, often uncomfortably so. How many times have you a witnessed a team coming to a grinding halt only minutes after they started their climb to strip off? When it comes to layering often less means more in terms of efficiency and warmth. This is pretty well the system for every expedition, be it a local climb in the Pyrenees or a super high altitude climb to the summit of Aconcagua. Here is our easy to remember “things to remember” list for when out and about. Start your climb wearing 3 layers. You’ll be surprised how little you’ll have to stop to adjust your layering systems. The base layer must be a good quality effective wicking and breathing layer. It sheds any moisture build up away from your skin which in cold conditions allows you to keep dry and warm. Mid and outer layers trap air and are heated by your body. Must have zips and hoods. Zippers allow you to regulate your body temperature easily and hoods are a quick solution to warm your head. Jackets and over-trousers used as the “extreme layer” must have zippers and be easy to put on. Consider getting over-trousers which are easy to put on over chunky trekking boots and have an integrated gaiter system. Jackets should have hoods that can be closely sealed and are roomy enough to fit over a helmet. The standard rule is to add another down layer for warmth and Gortex for reliable water-proofing. Remember that it is ok to add to or remove any of the 3 layers when you get uncomfortable. These recommendations are not set in stone. And don’t forget to think about gloves, hats and sunglasses. These recommendations are basic “know-how” information for both trekkers and mountaineers. Remember, though that certain layers work best for certain situations. A thin fleece mid-layer would be ideal for a summer walk in the Pyrenees but would not be suitable for a climb on a 5-6,000m mountain. Research the appropriate qualities of a layering system before you purchase it or get in touch with an expert at Berghaus or 360 Expeditions for advice. 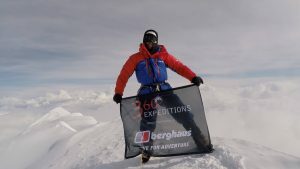 Personally I love Berghaus and I have now tried and tested their kit extensively and have enormous trust in the quality and properties from easy low level day trekking right up to the height of Everest so have included their products as examples to illustrate what type of clothing we refer to for our layer systems. Examples of Base layer top: Remember in awesomely cold conditions try wearing 2 pairs of base-layers. Berghaus long sleeve Neck Tech T-Shirt: Demon wicking properties. Berghaus Extrem 7000 Hoodie: Our guides often wear this as a base-layer for their 6,000m plus expeditions or as a light mid-layer for when on smaller mountains. Berghaus Cold Climb Fleece jacket: Inspired by Scottish winter conditions. Berghaus Duneline Hybrid fleece: Versatile bit of clothing for smaller hills. Berghaus Fortrose Pro 2.0 Gillet. Berghaus Extrem Fast Hike Trousers. Berghaus Extrem Ulvetanna Hybrid 2.0 Down Insulated Jacket: Our guides favourite outer-layer in any cold conditions. So warm, so light, so everything good! Berghaus Tephra Stretch Down insulated Jacket. Berghaus Pele Down insulated Jacket. Berghaus Ben Alder 3in1 Jacket. Examples of Outer layer trousers:These can be worn directly over base-layer. Provide more durable, wind and tear resistance protection than normal mid-layer trousers. Examples of Gnarly weather layers: For when the weather really comes in be prepared to add another layer to make yourself really bomb-proof. Down for warmth and Gortex for waterproof. Berghaus Extrem Ramche 2.0 Down Jacket: laugh in the face of adversity. This jacket is the bees knees for keeping you toasty in any storm or simply slipping on when belaying your buddy on a gnarly pitch. Berghaus Dalemaster or Ridge master water proof jackets. Berghaus Pacelite Storm water proof jacket. Berghaus Hagshu water proof jacket. Berghaus Extrem 8000 Pro Bib Trousers: the definitive mountaineering pants. Berghaus Extrem 8000 Pro Jacket: the definitive mountaineering jacket.